The OECD has produced an international study of well-being and how young people feel about their lives. The think tank's education director Andreas Schleicher explains how much positive impact can come from simple changes such as parents taking time to talk to their children and eating a meal together. 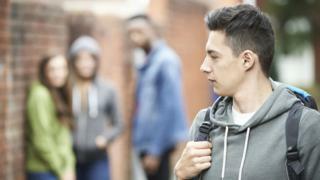 Perhaps the most distressing threat to student well-being is bullying, and it can have serious consequences for the victim, the bully and bystanders. This international study shows how widespread this can be, across borders and cultures, in schools of many different kinds. On average, across OECD countries, about 11% of teenagers reported they were frequently mocked, 7% were "left out of things", 8% were the subject of hurtful rumours and about 4% - that is still roughly one per class - were being hit or pushed around. A substantial number of young people feel isolated, humiliated, feel like an outsider at school or are physically assaulted. This matters, because schools are not just places where students learn about academic subjects. It's one of the first places where children experience society and the behaviour of other people. It should be where young people learn about resilience and ambition. And whether positive or negative, this time in school will have a profound influence on these young people. The evidence of countries such as Finland, the Netherlands and Switzerland shows that it is not a case of choosing between high academic standards and high levels of satisfaction with life - it is possible to have both. It also shows there is no link between long hours of study and students' sense of satisfaction. The frequency of tests, perhaps counter to expectations, also seems to be unrelated to anxiety about school. But what does seem to make a difference to well-being are the relationships between students, teachers and parents. A negative relationship with teachers is a major threat to students' sense of belonging in school. And conversely, "happy" schools are likely to report much more positive relations between staff and students. On average across countries, students who reported that their teacher is willing to provide help and is interested in their learning are also about 1.3 times more likely to feel that they belong at school. Students who reported unfair treatment by teachers were 1.7 times more likely to report feeling isolated. This is important. Teenagers look for strong social ties and they value acceptance, care and support from others. Adolescents who feel they are part of a school community are more likely to perform better academically and be more motivated in school. There are also big differences between countries on these measures. About three quarters of students feel they belong at school, and in some of the highest performing education systems, including Taiwan, Japan, the Netherlands, Vietnam, Finland, South Korea, Estonia and Singapore, that share is even higher. But in France it is just 41% - and there can be big differences in some countries in this sense of belonging for children from immigrant families. While the frequency of tests might not affect student well-being, there does seem to be a more negative influence if tests are seen as "threatening". This anxiety, even among well-prepared students, can also be linked to the relationships with teachers. If teachers are seen as supportive there is likely to be less stress. Where students feel that teachers do not rate their chances of success fairly, there is even more worry, with 62% of students reporting high levels of exam tension. And in all countries, girls reported greater schoolwork-related anxiety than boys. The fear of making mistakes on a test often disrupts the performance of top-performing girls who "choke under pressure". Another major factor in young people's lives is the time spent online. Across OECD countries, 26% of students on average spend six hours per day online at weekends and 16% spend a similar time online on weekdays. Extreme internet use, more than six hours per day, has a negative impact on students' well-being. Last but not least, parents make a big difference. Students with high levels of life satisfaction were significantly more likely to have parents who regularly spent time talking to them. Parents who sat around the table to eat their main meal with their children and talked about how they were getting on at school also made a difference. "Spending time just talking" is the parental activity most frequently and most strongly associated with students' life satisfaction. It seems to matter for academic performance too. Students whose parents regularly talked to them were two-thirds of a school-year ahead in science, and even after accounting for social background, the advantage remains at one-third of a school year. The results are similar for parents eating meals with children. The strength of this relationship is well beyond the impact of most school resources and school factors measured by Pisa tests. Even though this shows the powerful positive effect of parental interest, for many parents, spending time just talking to their child is a rare occurrence. Some parents find it difficult to participate in their children's school life, maybe because of inflexible work schedules, lack of childcare or language barriers. But schools could do more to help parents overcome these barriers. If parents cannot leave work to attend school meetings, then perhaps parents could talk by phone or video. There could also be support from government, such as incentives for employers to improve the work-life balance. Parents can also help children manage test anxiety by encouraging them to trust in their ability. Girls whose parents encouraged them to be confident in their abilities were 21% less likely to report feeling tense about schoolwork. Most parents want their children to be motivated at school and motivated students tend to do better. On average, students who are among the most motivated score more than a school year higher in Pisa tests than the least motivated students. Motivation is also related to life satisfaction in a mutually reinforcing way. Students who are highly satisfied with their life tend to have greater resilience and are more tenacious in the face of academic challenges. But there can also be downsides when there is too much external pressure. Countries where students are highly motivated also tend to be where many students feel anxious about tests, even when well prepared. They need to find a way to encourage achievement without generating an excessive fear of failure. The challenges to the well-being students are many and there are no simple solutions. But the findings from this study show how teachers, schools and parents can make a real difference.